The title of this post may have you thinking, “Oh god, Jenny is about to rant about how much she loves artichokes and goat cheese again.” Lucky for you, I think I have established that. Instead I am going to talk about casseroles/stratas/any other dish you can cook in one pot/casserole dish. There is something that eases my mind when I am able to make an entire meal without having to wash tons of pots, pans and skillets afterwards. If you don’t make one-pot-meals very often, you really should give it a try; there is something therapeutic and relaxing about its simplicity. 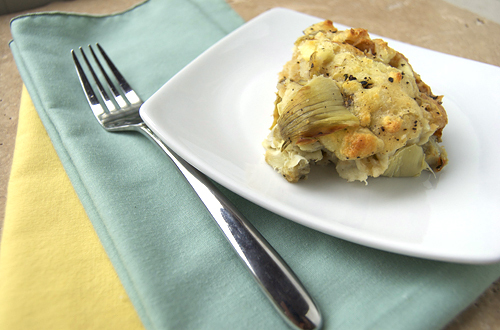 This dish is a strata, which is a layered casserole, usually with egg soaked bread. It is a great one-pot breakfast recipe. I think that the ingredients in this particular strata make is great for any time, not just breakfast. As always the artichoke and goat cheese make an excellent pair. 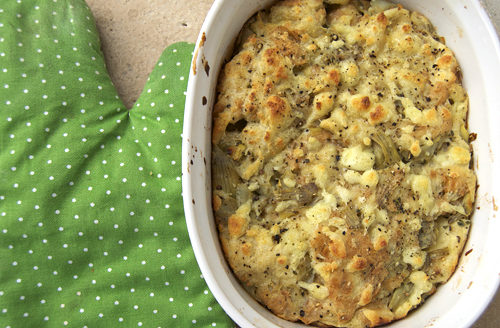 The bread also adds a nice texture to an otherwise soft dish. So sit-back, relax and cook up a fancy breakfast without filling your sink with dishes. Heat the olive oil in a large skillet over medium heat. Add the shallots, garlic and artichoke hearts and sautee until the artichoke begins to brown (about 8-10 minutes). Remove from the heat, stir in the herbs and let cool (about 10 minutes). Whisk milk, salt, pepper and eggs together in a large bowl. Add the Parmesan cheese and toss in the bread until well combined. Preheat the oven to 375F. Mix the artichoke mixture into the bread mixture and let sit for 20 minutes. Grease an 8" square baking dish and pour half of the mixture into the dish. Next layer with half of the goat cheese. Repeat until all ingredients are used. Bake at 375F until browned and bubbly (about 45-50 minutes). I bet the flavor in this is OUT OF THIS WORLD. Holy deliciousness! I love everything about this dish…totally making it for dinner tonight!! This looks FANTASTIC! Goat cheese one of my favorite things EVER! I would love this for breakfast, lunch, or dinner! If I had tried to get you to eat anything like this even 3 years ago you would have turned up your nose. You’re going to love trying all the new things in Italy!!! Wow. Talk about being creative with two of my favorite foods. I need to throw a dinner party, just so I can make this. Yum! Holy yum! I love stratas and casseroles in general! They are the only reason I like the colder months. Thanks for sharing! Looks absolutely gorgeous! Looks good and one casserole is good news! Definitely going to try one day. I don’t like washing dishes. This looks delicious! I’d love to make this for dinner. LOVE!!! You had me at goat cheese! This looks divine and has some of my favourite flavours. Question: could you use canned artichoke hearts? I’ve never seen frozen (truth be told I’ve never really looked). Yeah canned works fine. I just like frozen veggies over canned because there are less preservatives and extra additions, but either works! I absolutely have to try this!! Oh I love this! I love that there are bread cubes in there too. Yum!! Oh – delish! Add a rotisserie chicken to the mix and my hubby would leave a smoke trail getting to the dining room table! This sounds ridiculous! Anything with artichokes, and I’m in!! You seem like you’re turning into a really great cook. Forget about breakfast, this sounds like it would be a huge hit as dinner!! Or, a really fancy brunch party, something about the goat cheese makes it seem fancier. Love this. it looks great,i never tried atrichoke exept than classical as olive oil dish, this sounds interesting.. This looks drool inducing. Definitely trying this myself! What a lovely dish….. I love everything about this dish, simply Delicious!!!! Oh Jenny, you just stole my heart again! Not only do I love your writing style and your photos, but that strata looks heavenly! I might have to make it tonight…..yes, I will. Wow that is one of the nicest things anybody has said! I never know if people like my writing so that is great to hear! =) Thanks! Your artichoke and goat cheese dish looks so deliciously comforting. You’ve been buzzed! YUM! This looks absolutely divine! I am going to make it this weekend!!! sounds perfect for lunch. Love the flavor combination. Mmm this looks absolutely amazing!! 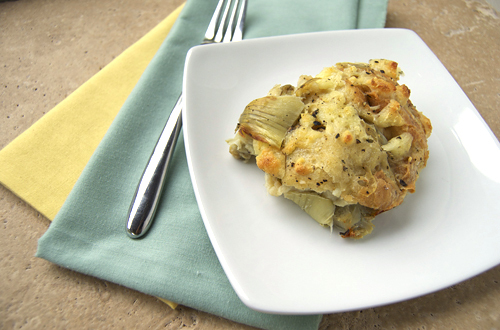 Love the goat cheese & artichoke combo, I’m definitely trying this one out!